Thanks to the versatility of the Body & Shape Set, you train efficiently your whole body. The set is not only of varied use, but also mobile. Thus, you can do your shaping training indoor and outdoor. The aerobics weights help to increase strength-stamina and to strengthen your torso muscles. The multi training bag allows to combine the metabolism, strength, and coordination training. 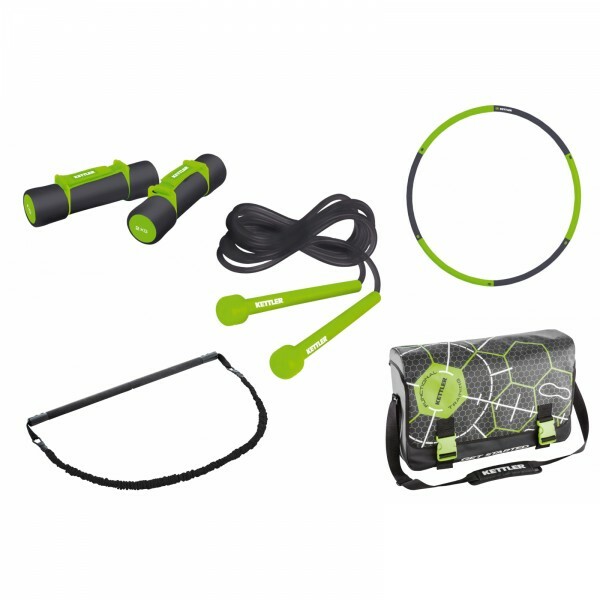 The Honolulu loop and speed rope of Kettler support fat burning and motivate to increase stamina. After the training, you can easily disassemble the Kettler Honolulu loop and transport it. The set is also equiped with the trendy messenger bag. In addition, the training App VirtualGym offers a digital training support. Thanks to the App, you can record your training data and create an individual training and nutrition plan.